Buell Blast (all). 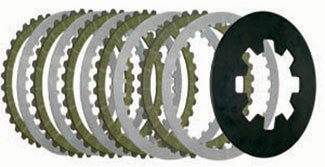 Includes 5 Kevlar® friction plates on tempered steel cores. Starburst groove pattern for maximum heat dissipation and oil circulation. Included are 5 tempered steel drive plates and a 15% stronger than stock diaphragm clutch spring. Clutch has 15% more surface area and a pre-measured stack height for easy, accurate installation. MAKE THAT BLAST DO WHEELIES!